Deforestation is a global reality that significantly contributes to climate change. Who knows this better than Ethiopians, who have suffered through severe drought in recent decades? They have endured years of displacement and starvation. Those in rural areas often suffer the most. And yet, despite this reality, thoughtful women like Workinesh Bayisa, continue to cut down trees to use as fuel for their cook-fires. With no electricity or gas, fire is her only means of providing meals for her family. She has no alternatives. Every other day, Workinesh walks a day’s journey into the bush to collect firewood and bring home as much as she can carry. And thousands of women around her do exactly the same. Workinesh cooks over an open fire where wind wicks away precious heat and causes the dwindling firewood to burn at a rapid rate. This inefficient method drives both human exhaustion and forest depletion. In addition, cooking over an open fire creates health concerns for the whole family. “Smoke from the open fire was another problem which was one of the causes for regular respiratory and eye diseases for my family,” Workinesh explains. 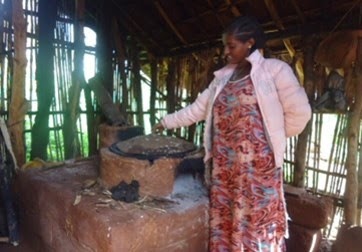 So when Food for the Hungry (FH) Ethiopia offered to teach women in Sasiga, Ethiopia how to build more efficient wood-burning stoves, Workinesh was delighted. “I used to use the open fire stove, and that was consuming a large amount of firewood. I used to go long distances every other day to collect firewood, which was very tiresome,” she remembers. The stove that Workinesh built for herself after receiving FH training is slowing the rate of deforestation from firewood gathering by 50%, while still being a locally sourced and sustainable technology. Adaptable and forward thinking women like Workinesh set an excellent example for the rest of us. Are we willing to change our fundamental habits in order to do our part to improve long-term health, reduce deforestation, and slow climate change? Learn more about Food for the Hungry initiatives in Ethiopia.